The elements of a championship ring should symbolize and celebrate the team’s memorable accomplishment. 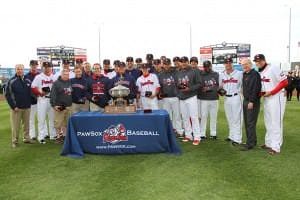 The Pawtucket Red Sox formed a ring committee when they won Minor League Baseball’s International League Championship (aka Governors’ Cup). Their goal? To create the perfect keepsake. They wanted the finished product to embody the hard-fought 2014 title that they won. The Governors’ Cup is the trophy awarded each year to the champion of the International League, one of the two current Triple-A level minor leagues of Major League Baseball. It’s a prestigious accomplishment worthy of celebration. As the Paw Sox ring committee worked on the design, they decided to keep the ring simple, but immediately recognizable as a Red Sox championship ring. The committee worked with Herff Jones to create just that sort of ring. During the season’s Home Opener, the team celebrated their championship—and received their rings. Many Herff Jones employees from the Warwick Jewelry Plant attended the game to see the ring presentation.